High Key Cyclamen and IOW! When I was thinking what kind of flower could be a model for my next photos a Cyclamen came to my mind as a flower commonly grown during winter at homes. I wanted a white colour variety which has violet petal edges but this was not on stock in a flower shop so my wife bought a simple white. For a while I was racking my brain how I could photograph it and then I realized that I wanted to try high key technique for some time now and this might be a great subject for it. If you are not familiar with High Key lighting/photography I can say that it is a form of lighting, or a photography captured in Hey Key lighting, which results in a scene/photo with the biggest amount of image data in bright tones with very low contrast and no or almost no dark areas. If you imagine a histogram of such a High Key photo, the most of data, if not all, will be in right half of it. If you are still interested to read more about it, you can find plenty of information using Google search, e.g. here or here. When I decided for a High Key I already visualised the result how I would like to see it. I wanted to achieve a similar look as in wonderful images of excellent artist Ron van Dongen, e.g. here (in colour) or here (in BW). I was not sure if I wanted a B&W result or if I leave some colour. I only knew that I want it to be original, not only a copy of Ron’s technique. And here are results. The background was a white glossy sheet that helped to reflect some of the light (I realized this only after looking at results. I didn’t realize it before). A light was quite weak winter afternoon light in an overcast day. Even though I am pretty happy with these I wondered how it would look with a hint of colour. You can see my attempt here. As I was really pleased by these results I would like to take more such photos in future. Actually, I think that this might be a good starting point for new series. 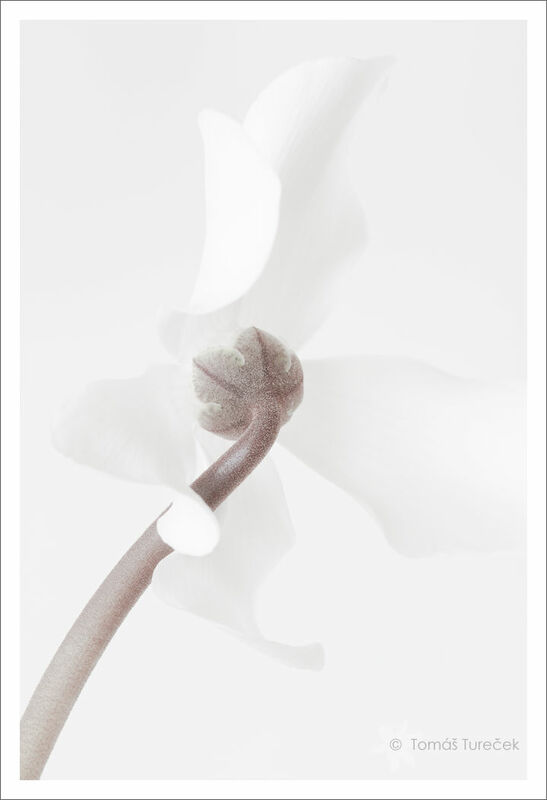 I have already a name for it – Flora in High Key. I would like to mention one more thing nowk. You probably noticed the IOW in the title of this post and those of you who know photography forums and magazines know that it means Image Of the Week. 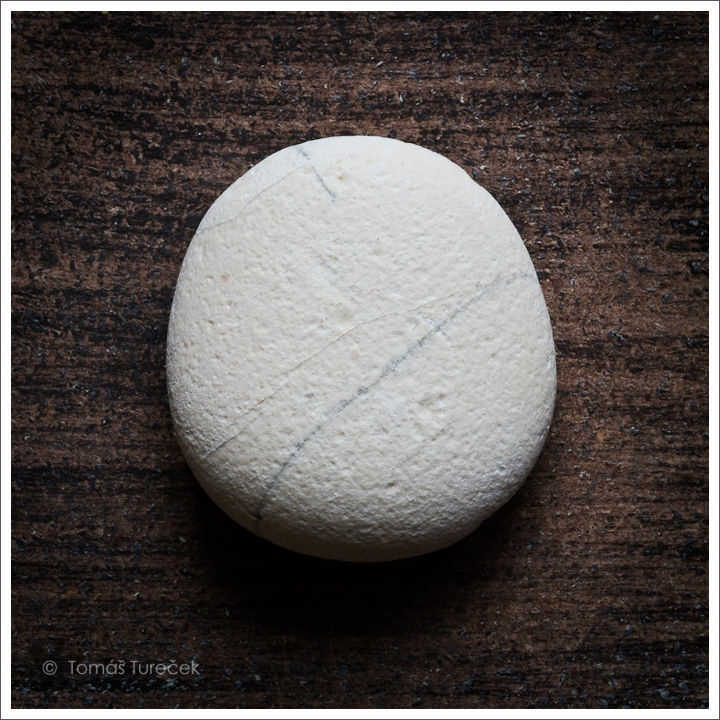 I was pleased when my photo Marble Pebble (originally posted here) was chosen as an image for current week on NatureScapes.net network (NSN) in Photo and Digital Art thread. You can find the winning post here. I hope you like these High Keys and wish you to enjoy the winter in its full strength! Technical information: both images were taken with Canon EOS 450D camera and Canon EF 100mm f/2.8 USM macro lens upon a tripod in a dim winter light during overcast day, indoors, with all post-processing done in Adobe LightRoom 2.5. These are both very nice Tomas. I probably have a preference for the color one as well, simply because it has a bit more contrast to define shapes and lines. Congrats on the IOW. Congratulations on your IOTW! Way to go! I love these Cyclamen. Very artsy and your ‘high key’ processing resulted in wonderful pieces of art. (frame them!) I prefer the B&W, but would like a tad more contrast, which the color versions supply. That is secondary to the fact, however, that I love them all! Thank you, Barbara! I’m glad you like these. It seems that BW version really needs more contrast, even though it’s fine in my eyes, so I guess I’ll add some. Thanks for suggestion. These are gorgeous! Very well done!!! Excellent!! Some of your best work. You positioned the flowers in the frame just right. Graceful and simple. Beautiful lines. If you are going for the von Dongen look, I do think the B & W are fine as they are. His is a soft look, with the details almost disappearing. For the colored ones, can you make that hint of color extend to the whole image? That is, do more of a tone change than a coloring, with the grays becoming tans. Would like to see these in color, also. I love von Dongen’s work! 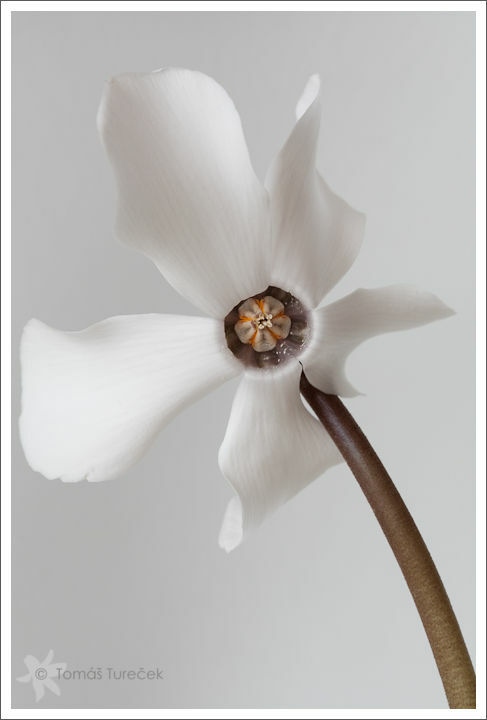 He is one of my favorite flower photographers. Hi Anita, it was you who told me about van Dongen so I thought you will like these 🙂 I was inspired by his art work but wantedto do it my way. In this kind of images (he calls it WOW series – white on white) he has always white background and the blossoms are not fully detailed, sometimes there is only hint of shapes and shadows. In these of mine you can see that the background is gray even though it was white glossy sheet. If I raised the exposure or brightnes so that the background was white there was very few details in blossoms and I didn’t like it therefore I decided for adjustments which you can see now. Re. your suggestion about tone change, I’m not sure that I understand you well. Do you mean to change the tonality of coloured version so that the grays in whole image become tans or to add a tan overlay to BW version? And by “Would like to see these in color, also” you mean that you would like to see them without high key treatment or with full saturation? I can also post original image if you are interested. I couldn’t remember if I’d told you about van Dongen. Thanks for reminding me. I completely understand about why you left the bg a bit grey. White on white is a huge challenge! But, wonderful. I did mean to change the tonality of of the colored version so that the grays become tans. What did I mean re. seeing them in color? I assumed you had changed it to B & W or the stems would not be grey. I would like to see the originals, if it is not a problem. I have found grey days to be excellent for indoor natural light photography of flowers. I’m going to try some of these myself! Hi Anita. I think that pure white on white is more about equipment and set up than about technical skills. If you shoot white flower aginst white background, the background will be usually a bit more grey than the flower because it’s farther from the lens and thus less light reflects from it to the lens than from the blossom. Maybe a light box or better lighting in general could help to solve this. 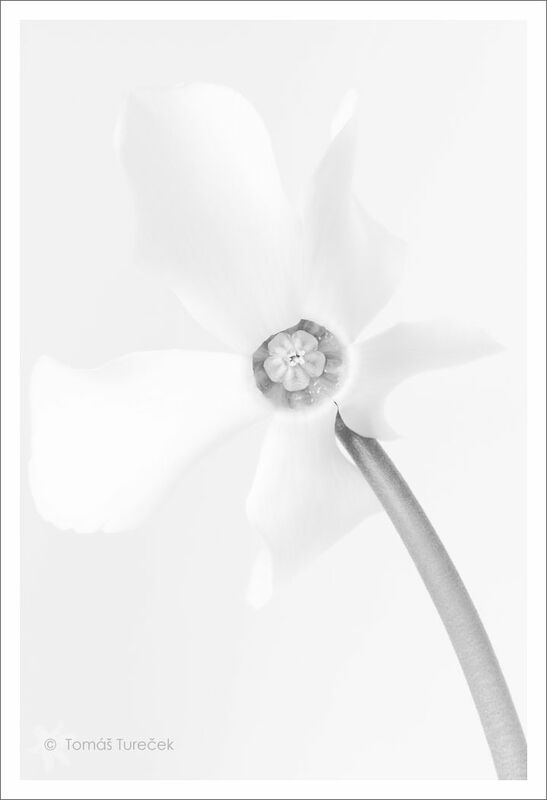 I tried to change the tonality as you suggested and the result is here: https://closenature.files.wordpress.com/2010/01/fhk-001-cyclamen-720px-tan.jpg. The background is coloured very slightly. I like the version with grey background more though. And here are original photos without any adjustments: https://closenature.files.wordpress.com/2010/01/fhk-001-cyclamen-720px-original.jpg and https://closenature.files.wordpress.com/2010/01/fhk-002-cyclamen-720px-original.jpg. I agree that these winter days, grey days as you called it, are best for this kind of photography because you get nice smooth ambient light, no hard shadows. I think that something like a light box and pair of strong lamp lights could help to take such shots anytime. I’m looking forward to seeing your attempts! First, congrats on the IOW. Always nice when one’s work is recognized by others. Barbara and Anita have taken their share of IOTW on BPN for their wonderful flower images. Which brings me to your images. I will certainly defer to Anita and Barbara on these. As Anita can tell you, white backgrounds and high key are not really my cup of tea. But I do like your images. I only wish for a bit more contrast or something to separate the petals from the background more. They seem to blend a little too much for my tastes and I lose the flower. Thank Ed. I should say that one of these images also became IOW of current week on NatureScapes.net. This is new series of mine on which I’d like to focus and I wonder what fruit it will brings 🙂 With High-key images it’s always tricky because brightness and contrast of every single monitor differs and it may influence viewing experience significantly. The only way to be sure that you watch it properly is to have calibrated monitor which I don’t have. It is possible that you have your contrast or brightness setting a bit higher than I and that makes you seeing the flower blending into the background. There are some places in the images where the difference between petal and background is so small that it really looks like blending into the background. With high keys it’s always about searching for balance between what is yet contrasty enough and what is already blending into the background and This look as I wanted them to look like 🙂 If you saw some work by Ron van Dongen, some of his high-keys are much more bright than these and I don’t like it so. Anyway, thanks for letting me know your opinion. I knew that especially these images may cause problems in viewing them properly.